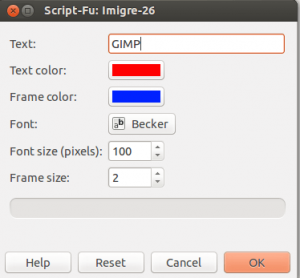 GNU Image Manipulation Program (GIMP) is a free and open source alternative to Photoshop that is available on Windows XP, Vista, 7, 8, 8.1, Mac OS X, and Linux; it provides huge network of extensions and add-ons. Today I will cover a useful feature in GIMP, that feature is logo and graphic creation. To generate a logo in GIMP you will need to open the ‘File” menu and then select “Create” under the create menu please select logo. Now you will be presented with a large list of design choices for your logo. Choose one and follow me. For reference I chose Imigre-26 and so for this next part, your window may look a bit different. Now you have a window asking you a few questions and giving you colour options. Simply click and play around with these settings if you choose. Now click “OK” and your logo has been created. There are lots of reasons that one might wish to generate a button, but the most foremost is web development. You can easily accomplish an elegant button in GIMP for very little effort. To create a button select the “File” menu and then “Create” and finally “Button.” Under the “Button” menu you have the choice of Round or Bevelled. I used Bevelled and so your screen may look a bit different. These screen offers you a bit of a different choice for the appearance of the button. Much like the logo, feel free to play with the options. One notable different between the button and logo is the option to have the button in the pressed state. You can choose this option to make it look like the user has clicked the button. Presto! you have a button for your latest website project. By far one of the coolest features in GIMP is to create a beautiful and awesome planet. There are not many practical uses for this feature unless you are creating a game graphic or firefox based browser logo. 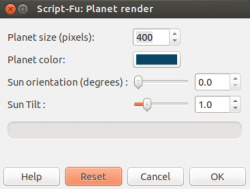 To create you own planet simply follow the steps from above (Select “File” menu then “Create” menu and finally “Misc”. 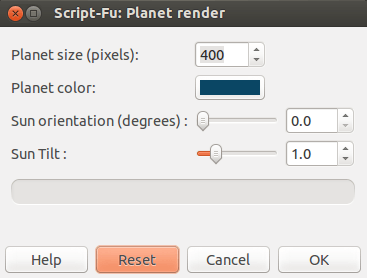 Now select ‘Planet Render. This will open up a dialogue window, select the colour of your planet and if you wish change the sun tilt options. Any part of learning GIMP is best done by trying and trying over again. Once you click “OK” you will have your own little planet for further editing. When you are designed a website, you will need to make theme elements. These elements could include arrows, bars and other pieces. GIMP will not generate the nice-est looking elements but you can always adjust and play with them though. To create these design elements follow the File>Create>Web Page Themes. Now you will need select a overall theme, Alien will be black and green and Bevelled will allows to choose a texture. You will be presented with our good old dialogue screen and depending on which option you have chosen you will need to select the colours or textures. Hopefully this article gave you something new to try in GIMP. In general I try to keep my articles Linux based and so I am asking you, if there is any Linux based articles you would like to see? Perhaps a program or feature you don’t quite understand, or maybe burning question in the world of Linux. Let us know in the comments below !